ECHINODERMATA : ECHINOIDA : Echinidae STARFISH, SEA URCHINS, ETC. 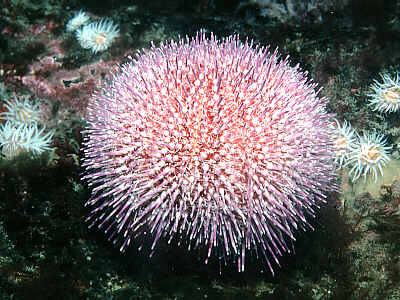 Description: The common sea urchin in shallow water in the British Isles. Globular in shape and pink in colour. The spines are abundant, relatively short and more or less all of one size in larger specimens. Up to 15cm. diameter. Habitat: An almost ubiquitous species on hard substrata in northern Britain especially in the infralittoral zone where it grazes on algae and encrusting animals. Distribution: Found around most of the British Isles but becomes rare in S. Devon and Dorset and absent in the eastern part of the English Channel. Also reported to be absent in parts of Anglesey and N. Wales. 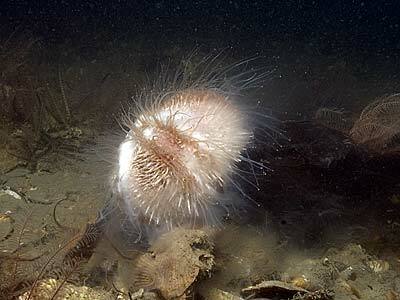 Similar Species: Echinus acutus has not been recorded by divers but may occur in shallow water on North Sea coasts. It normally lives in deep water (200m+) and has fewer spines with obvious, long, robust primaries 2-4 times the size of the smaller secondaries. Primary and secondary spines of similar size. Picton, B.E. & Morrow, C.C. (2016). Echinus esculentus Linnaeus, 1758. [In] Encyclopedia of Marine Life of Britain and Ireland.